It's summer, which means salad season! This little number I adapted from epicurious.com. I kicked up the dressing to give it more flavor, and added nuts and cranberries that work nicely with the sweet and anise flavors in the slaw. I made this for a 4th of July picnic last year and it was a big hit. Summer means easy and no hot ovens, so grow your repertoire of slaws and salads to keep yourself out of the kitchen and on your deck with your family. Summer is so short, enjoy every minute! In a small bowl prep your marinade. Whisk together the apple cider vinegar, lemon juice, tarragon, sugar, honey, water, tarragon and chopped fennel fronds. Season with salt and pepper to taste. Finally, add the olive oil as you whisk to emulsify the marinade. Set aside briefly. Next use a mandolin to slice thinly the anise bulbs and the celery stalks. If you don't have a mandolin, slice the fennel and the celery very thinly on a nice diagonal. Next core the apple, and julienne. 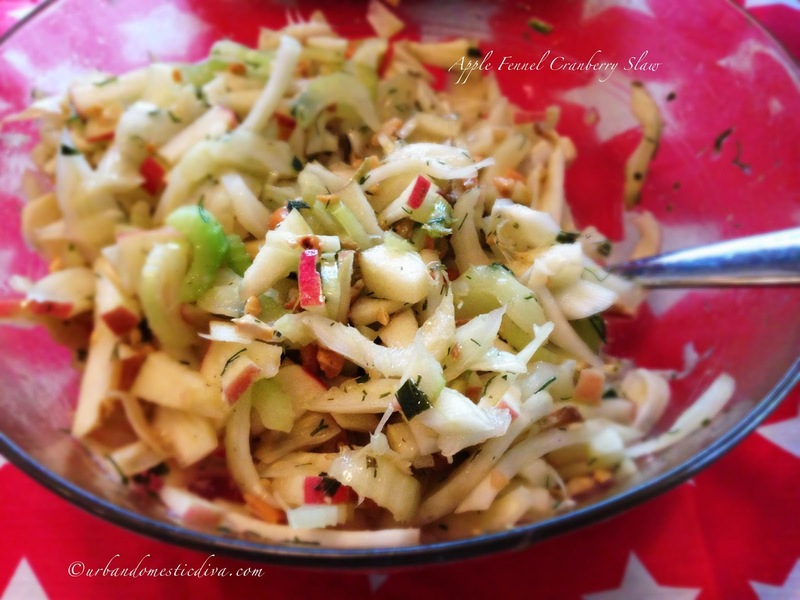 In a large bowl add the sliced fennel, celery, and apples. Add the marinade, and toss to coat. Let the slaw marinate in the refrigerator for a few hours. Before serving, add the chopped cashews and the dried cranberries if using, and mix. Serve slightly chilled.